Your 6 or 7 year old might be asking about sleep away camp this summer, and you’re torn. 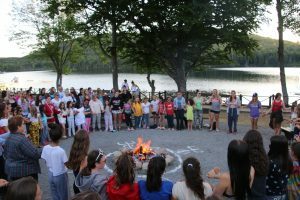 How can you tell if your child is ready for the camp experience? First, are you ready as a parent to let your child go? It’s difficult to get a hard and fast age, because every child is different. A lot has to do with your child’s expectations. What their expectations are can help you decide if they understand what camp is all about, and if they’re ready to go. If this is not the summer for camp, how about a tour of our facilities for a future summer? Call or e-mail us to make an appointment for our summer tour dates and our Rookie Day. You can also click here to schedule a tour. Compare your child’s age with the ages of the other campers, and ask us about our outstanding counselor to camper ratio. Your confidence is so important to us…your confidence in your child’s ability, and your confidence in the camp, itself. Rest assured, even the best prepared camper experiences a little homesickness, especially that 1st summer away. It’s a natural part of separation. Ask us, “What do you if my child gets homesick?” “Can I speak to you directly?” “How can you accommodate my child with dietary restrictions?” Don’t be afraid to ask questions. It’s your child. If it’s important to you, it’s important to us. And if you make the decision to send your child to camp, good luck and congratulations. What an amazing gift! Now bring on the S’mores!